There have been important market developments in the north of Europe concerning pellet production and trade. We explored this conditions in a preliminary working paper inside the PelleTime project. The following paper brings the latest conclusions on the topic, and expands the ideas of the working paper providing deeper analysis. SELKIMÄKI M, MOLA-YUDEGO B, RÖSER D, PRINZ R, SIKANEN L. 2010. Present and future trends in pellet markets, raw materials, and supply logistics in Sweden and Finland. Renewable and Sustainable Energy Reviews. doi:10.1016/j.rser.2010.06.009. Wood pellets have become an important fuel in heat and power production, and pellet markets are currently undergoing rapid development. 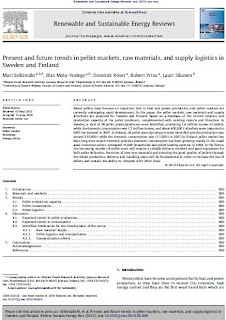 In this paper, the pellet markets, raw materials and supply structures are analyzed for Sweden and Finland, based on a database of the current location and production capacity of the pellet producers, complemented with existing reports and literature. In Sweden, a total of 94 pellet plants/producers were identified, producing 1.4 million tonnes of pellets, while the domestic consumption was 1.7 million tonnes, and about 400,000 t of pellets were imported to fulfil the demand in 2007. In Finland, 24 pellet plants/producers were identified and the production was around 330,000 t while the domestic consumption was 117,000 t in 2007. In Finland, pellet market has been long time export oriented, whereas domestic consumption has been growing mainly in the small scale consumer sector, estimated 15,000 households had pellet heating systems in 2008. In the future, the increasing number of pellet users will require a reliable delivery network and good equipment for bulk pellet deliveries. Provision of new raw materials and ensuring the good quality of pellets through the whole production, delivery and handling chain will be fundamental in order to increase the use of pellets and sustain the ability to compete with other fuels. 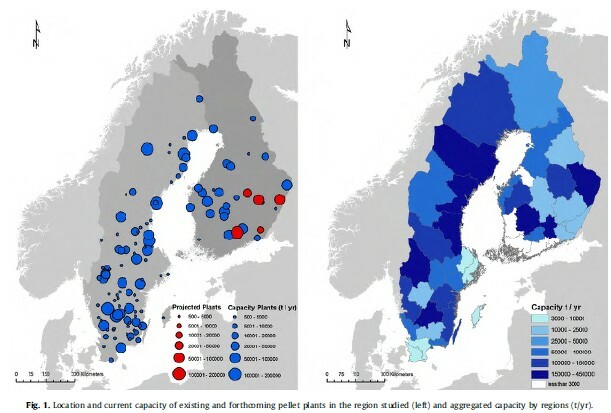 On the right, a detail of the paper (showing figure 1), including the location of the current pellet plants in Sweden and Finland, as well as the resulting aggregated pellet capacity by regions. The map also includes the projected pellet plants. However, the recent economic crisis and its effects on the forest sector can affect the realisation of these plans.